The narcissist often strikes people are "laid back" - or, less charitably: lazy, parasitic, spoiled, and self-indulgent. But, as usual with narcissists, appearances deceive. Narcissists are either compulsively driven over-achievers - or chronic under-achieving wastrels. Most of them fail to make full and productive use of their potential and capacities. Many avoid even the now standard path of an academic degree, a career, or family life. The disparity between the often meagre accomplishments of the narcissist and his grandiose fantasies and inflated self-image - the Grandiosity Gap - is staggering and, in the long run, insupportable. It imposes onerous exigencies on the narcissist's grasp of reality and social skills. It pushes him either to seclusion or to a frenzy of "acquisitions" - cars, women, wealth, and power. Yet, no matter how successful the narcissist is - many of them end up being abject failures - the Grandiosity Gap can never be bridged. The narcissist's fantastic False Self is so unrealistic and his Superego so sadistic that there is nothing the narcissist can do to extricate himself from the Kafkaesque trial that is his life. The Narcissist explains away the yawning abyss between his omnipotent and omniscient self-image and his drab, pedestrian life by attributing it to outside forces which conspire to keep him down – or by regarding it as an ineluctable, albeit unwelcome phase in his ultimate ascendance and self-realization. The narcissist is a slave to his own inertia. Some narcissists are forever accelerating on the way to ever higher peaks and ever greener pastures. Others succumb to numbing routines, the expenditure of minimal energy, and to preying on the vulnerable. 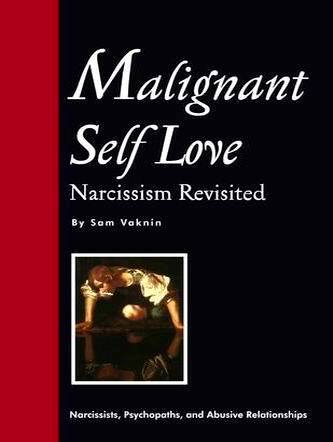 But either way, the narcissist's life is out of control, at the mercy of merciless inner voices and internal forces. Narcissists are one-state machines, programmed to extract Narcissistic Supply from others. To do so, they develop early on a set of immutable routines. This propensity for repetition, this inability to change and rigidity confine the narcissist, stunt his development, and limit his horizons. Add to this his overpowering sense of entitlement, his visceral fear of failure, and his invariable need to both feel unique and be perceived as such - and one often ends up with a recipe for inaction. The under-achieving narcissist dodges challenges, eludes tests, shirks competition, sidesteps expectations, ducks responsibilities, evades authority - because he is afraid to fail and because doing something everyone else does endangers his sense of uniqueness. Hence the narcissist's apparent 'laziness" and "parasitism". His sense of entitlement - with no commensurate accomplishments or investment - aggravates his milieu. People tend to regard such narcissists as "spoiled brats". In specious contrast, the over-achieving narcissist seeks challenges and risks, provokes competition, embellishes expectations, aggressively bids for responsibilities and authority and seems to be possessed with an eerie self-confidence. People tend to regard such specimen as "entrepreneurial", "daring", "visionary", or "tyrannical". Yet, these narcissists too are mortified by potential failure, driven by a strong conviction of entitlement, and strive to be unique and be perceived as such. Their hyperactivity is merely the flip side of the under-achiever's inactivity: it is as fallacious and as empty and as doomed to miscarriage and disgrace. It is often sterile or illusory, all smoke and mirrors rather than substance. The precarious "achievements" of such narcissists invariably unravel. They often act outside the law or social norms. Their industriousness, workaholism, ambition, and commitment are intended to disguise their essential inability to produce and build. Theirs is a whistle in the dark, a pretension, a Potemkin life, all make-belief and thunder.